The Yellow jersey (French: Maillot jaune [majo ʒoːn]) is the jersey worn by the leader of many multi-day (or stage) bicycle races, originally and most notably the Tour de France. It allows the rider who was in the overall lead at the end of the previous day to be easily identified. 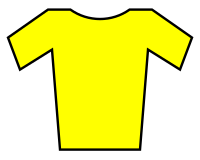 Because the Tour de France was the first to use a coloured jersey to identify the leader many newer races have chosen the same colour, for example the Tour of Germany. Other tours and races use other colours, sometimes because of the sponsor. The Giro d'Italia, Tour of Italy, have a pink jersey (maglia rosa). The race's original sponsor was the sports newspaper (La Gazzetta dello Sport) which printed on pink paper, like many European sports newspapers. The leader in the Vuelta a España (Tour of Spain) wears a red jersey (called "La Roja"). From 1998 to 2010 the Vuelta leader's jersey was gold in color. Sometimes a rider will get three yellow jerseys. In front of the press and spectators They are presented a special one that zips up at the back to make the presentation easier. An ordinary jersey to wear during the race the next day. An unused jersey to keep as a memento. They will sometimes also autograph many copies of the jersey that are given out to VIPs with the race and their team. This page was last changed on 10 May 2015, at 17:54.